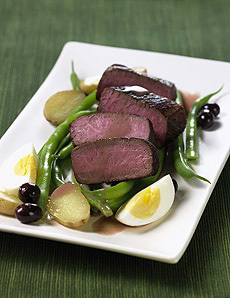 Lamb Niçoise: a delicious idea for lunch or dinner. Photography courtesy of Meat And Livestock Australia. Every nose in the neighborhood knows that spring is the start of cookout season. So start the barbie, as the Australians say, and enjoy these gourmet, yet easy-to-prepare, recipes. They were developed by Sally James, a leading Australian chef, food book author and television personality, for Meat And Livestock Australia, which represents producers of Australian lamb. This is Part I in a series of four spring lamb recipes. Use the index below to click back and forth among them. But first: What is spring lamb? Is it different from lamb you buy at other times of the year? Spring lamb simply refers to lamb that is processed between the first Monday in March and the first Monday in October. The lamb is usually 3 to 5 months old. Years ago, lamb production peaked during this season, because lambs born in harsh winter months, before heated barns and modern animal husbandry, would have a low chance of survival. Today, lamb production occurs throughout the year, and “spring lamb” is no longer a relevant term, except for marketing purposes. It sounds more exciting, but tastes exactly the same. Yet, to many people, Easter and the spring season is a good reason to serve more lamb. Our “spring lamb” recipes take advantage of fresh spring ingredients and/or the opportunity to grill outdoors—a treat available to people in many parts of the country only during the spring and summer months. This recipe uses lamb eyes of loin—the tenderloin or “filet mignon” of the lamb. It can be served hot, or chilled as a lamb salad (a great use for any leftovers). Remove sinew from the lamb. Heat oil in a nonstick pan over medium heat. Sauté lamb for 2-3 minutes each side (for medium rare). Cover with foil and allow to rest 5-10 minutes. Whisk all dressing ingredients together and season with salt and pepper to taste. Reserve 1 tablespoon. Add green beans, potatoes and olives to the dressing. Gently toss to coat the vegetables. To serve, slice lamb across the grain. Arrange the vegetables and eggs on platter or individual plates. Top with lamb and drizzle with reserved dressing. Serves 4.